This summer we’re gearing up for three road trips!!! We’re excited, and looking forward to making memories. So we checked out this book at the library The Night Before Summer Vacation by Natasha Wing. It’s a fun story of the craziness, and excitement when getting ready for a road trip. My son loved it, and was laughing throughout the story. However, even with all the excitement and anticipation for our road trips. I still need to keep my soon-to-be 6 yr. old busy during hours of long drive on the road. I made “road trip” busy boxes with recycled boxes! Reduce, reuse, & recycle! For little one’s road trip busy boxes, we have Spanish activities, geography, games, and more! The 1st road trip busy box is a Spanish summer busy box. It includes a Spanish summer sticker book, mini-books with Spanish vocabulary building words, crayons to color; and we’ll use the tablet to read Lucas en un Día en la Playa from Kids Yoga Stories. This book is perfect since we’ll be visiting the beach during one of the the road trips. I reviewed it last year, and it’s been one of my son’s favorite books! I also decorated the box with some pictures I printed from the e-book. The 2nd road trip busy box is about geography. Road map, USA puzzle, Little Passport field guide, & USA scratch book. Kid World Citizen has a post on using Google maps to “map” your road trips! Simply brilliant! I used that to decorate the box, and included in the box a puzzle for him to do, as well as Little Passport’s field guide, and the USA scratch book. 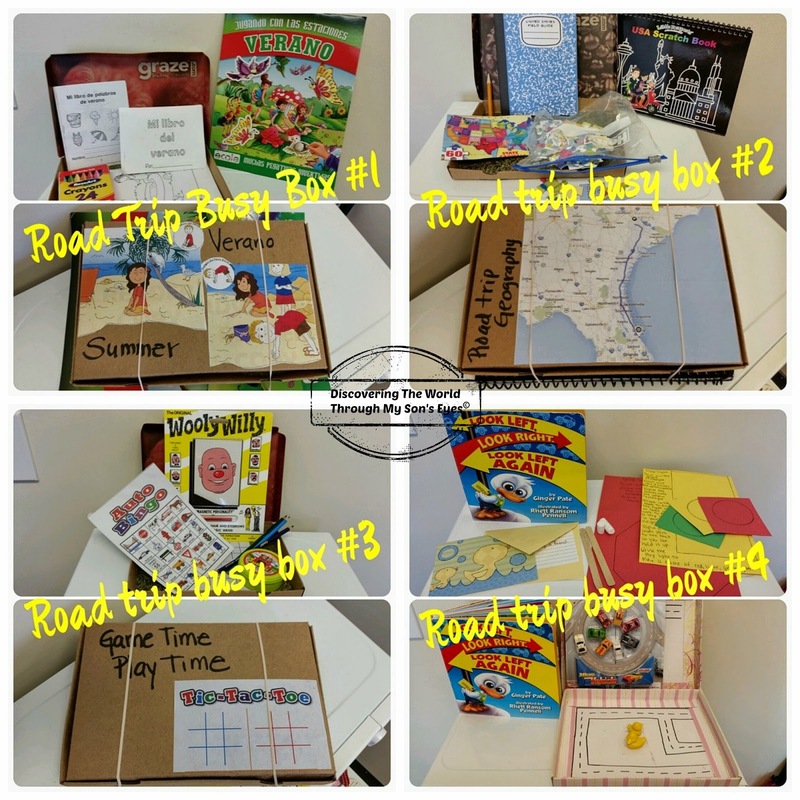 The 3rd road trip busy box is a simple one with games. Luckily for me in last year’s summer clearance I found pads of auto bingo, and tic-tac-toe (for 10 cents!). We’ll be playing with these during the road trip. I also included a Spot it! On the Road travel toy from Chic-Fil-A’s kids meal, and a Wooly Willy that I bought for him to play. For the 4th road trip busy box I used the book, and activity that I received from our participation in the 2014 Love Books Summer Exchange. (I’ll be writing a separate post on the contents, and activity). I also added two ducks, and made streets out of the inside of the box. As the element of surprise I included the mini cars wrapped in brown paper for him to unwrap, and play! Of course, for our road trip we have a portable DVD player, Spanish children’s audio books, and his Nabi tablet. The last box that I put together had glue stick, blank sheets of papers, markers, stickers, kiddie scissors, lacing cards, and sequence cards for him to create, play, and draw. (Not pictured). Hopefully these road trip busy boxes will help him keep busy, having fun, and learning at the same time! Great busy boxes! Looks like you're well prepared for a road trip… thanks so much for sharing this at After School! Great ideas and collection of ideas from other awesome blogs. I'll try box #2 this summer on our way up the East Coast USA.